The American composer Dan Visconti is in his very early thirties and has a pluralist, vernacular turn of mind. The selection of chamber music here - performed by some elite names from the Scharoun Ensemble Berlin and members of the Berlin Philharmonic Orchestra - range in date from 2000 (when he was 18) to the title track, which was composed in 2012. Part of that vernacular inheritance and heritage include reflections on, or refractions of the Blues. Black Bend is for string quintet (string quartet plus double bass) and its scurrying patterns include abrasive lines that soon open out into a full-scale bass and violin blues exploration, into which dialogue the other instruments soon intrude with duets of their own. Written for the very different, and dulcet, combination of violin and harp, Lawless Airs starts with lyrical guitar imitations from the harp, before glancing away to explore more tactile harmonies; the glass armonica is at the back of one’s mind from time to time. The solo bassoon is given the honours in Ramble and Groove and the pawky, repeated grooves also include elements of what I hesitate to call bowel-movement-music but feel, in the interests of accuracy, I ought. Much more to my taste is Hard-Knock Stomp for solo viola. If this title suggests composers like Robert Russell Bennett and Quincy Porter, perhaps that’s rather wide of the mark but the taut variations work well and the Blues certainly shadows the work closely. Composed for chamber ensemble and ‘delay unit’ Drift of Rainbows evokes a dreamlike state in its five-minute length. There’s considerable warmth here and so, too, moments of painterly colour. Fractured Jams consists of four movements and is composed for violin, clarinet, cello and piano. There are some caustic ‘go ape’ adventures in the first movement - the moments of reprieve come as balm - but there’s a down-home jug dance in the second. An eerie third movement attests to Visconti’s ear for telling detail and the final movement is laconic and slightly droll, rather as if William Burroughs were playing a Rag. In the light of all this the lyrical chanson that lies at the heart of Remembrances is a touch surprising, but very welcome. That he’s a composer who can spin a sonic surprise is evident in Low Country Haze for chamber orchestra, where lots of chatter, tapping and solemn lyric interludes punctuate the hazy melos. 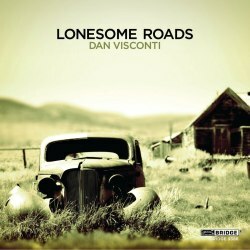 Finally, then, to Lonesome Roads, the most recent work and one that lends its name to the disc title. This is, at 18 minutes, the longest of the pieces recorded here. It packs a strong rhythmic charge, and there are bottleneck guitar evocations, interesting rock-influenced elements - especially rhythmic ones - and little wispy whistles and minimalist suggestions in the last of the roads. Cast for a conventional piano trio, perhaps this suggests the further pluralist directions yet to be taken by Visconti, roads as yet untravelled.